When my daughter got this book as a present, it really made me smile and we enjoyed sharing it... even though of course I was the perfect little girl!!! You can watch me introduce this story here on my YouTube channel; this might help you decide if you want to read the rest of the blog! This book can be enjoyed as the fun story of a mum trying to tell her child that she was the perfect little girl when she grew up... However the pictures tell a different story!! After each page, on the 1st reading, the teacher can ask: "Est-ce qu'elle...?" and the pupils will (hopefully) all reply: "Non!". On the second reading the children can act out what is happening in the story. 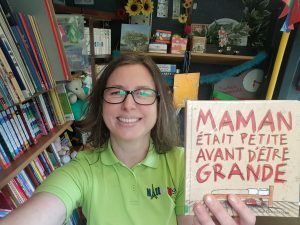 The text can later be adapted by the children with or without their teacher: they could change one noun or one adjective in each sentence or they could also think of other behaviours which are considered to be good and write about them in French (dictionary work). I want to use this book because the children will relate to it and to how adults might not always be as good as they say they are! It is also great to introduce and practise different negative structure and sounds in French (here in particular: o & an/en). The students could rewrite each main clause and either take the negation out or add it to the sentences depending on whether it was negative in the first place or not. This book gets the children to think about what is considered to be right or wrong as you grow up and how you may or may not have been brought up. Here is a pdf giving more ideas on how you can exploit this text: mamanetaitpetiteavantdetregrande. I have never used it in class yet but intend to very soon! Please let me know if you have used it already. You can buy the book here on Amazon.co.uk. I think this is the perfect book to celebrate mothers in all their imperfections. If you are looking for another suitable story around Mothers' Day, click here to check my recommendations. Were you well behaved as a child? Please tell my in the comments! I was as good as gold of course ha ha!